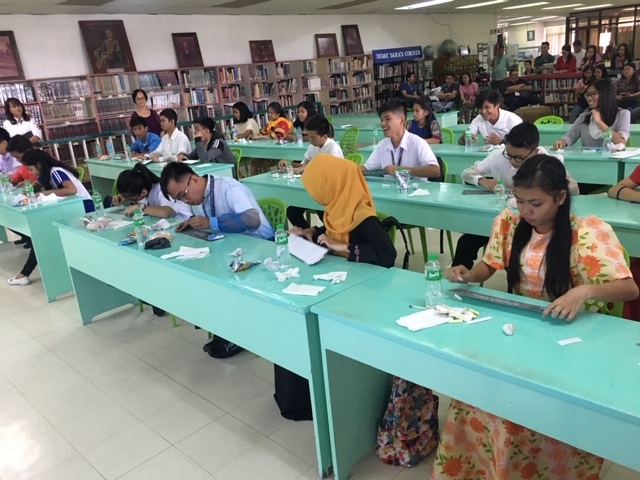 Davao City is turning 82 this year and there was a significant number of young people who participated in the annual Davao Quiz last Wednesday, March 6, at the Davao City Public Library to celebrate the city’s rich history. Davao Historical Society officers pose with the 24 participants of the 19th Davao Quiz. 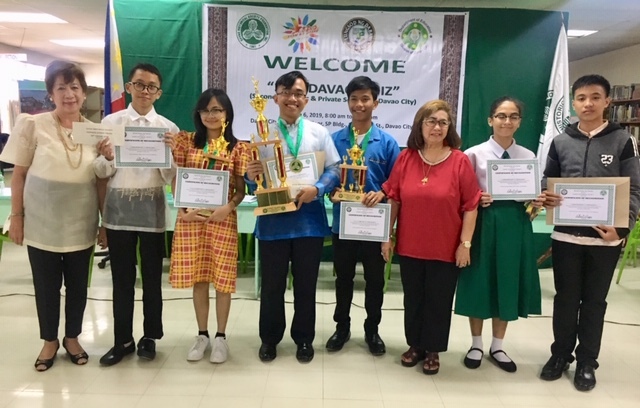 Organized every year to coincide with the Araw ng Davao celebration for 19 years now by the Davao Historical Society (DHS), the Davao Quiz aims to promote awareness and appreciation of local history among young Davaoeños. “Araw ng Davao is an appropriate occasion to recall its history and to know more about the people who contributed to Davao’s development as well as a venue for fellowship with our young historians,” shared Davao Quiz chair and DHS past president Nonito Delgado. There were 24 high school students from different public and private schools in Davao City who turned up to participate this year. They wore costumes reflecting the city’s diverse culture and the different periods of Davao’s history. Competing through three — easy, medium, and difficult — rounds with various points assigned to each question, all participating students were ranked at the end of the third round and the top six students with the most number of points won cash prizes. The Davao Quiz participants are from 24 secondary schools in Davao City. First place was awarded to John Paul Sapsal, Grade 11 student of Our Lady of Fatima Academy, who scored 83 out of a perfect score of 125 points. Second place went to Laureen Jade Alut, Grade 12 student of Davao Christian High School, who got 70 points. Third place went to Dindo Albino, Grade 10 student of A.L. Navarro National High School, who scored 65 points. Consolation prizes were awarded to Faye Marie Fuentes, Grade 9 student of Davao City National High School; Jan Oliver Dumangas, Grade 10 student of Bernardo Carpio National High School; and Joshua Patron, Grade 9 student of Los Amigos National High School. The top three winners received a trophy, a medal, and cash prizes of P5,000, P3,000, and P2,000 for the first, second and third placers, respectively. Consolation prize was P1,000 each for the other three winners. 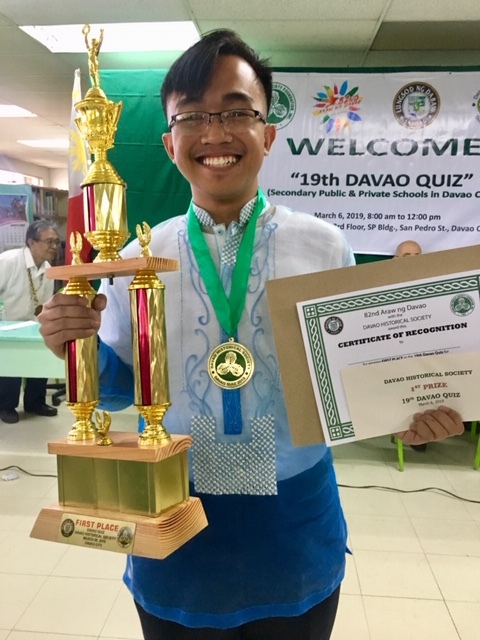 Davao Quiz champion Sapsal shared how he prepared by saying that he typed out a summary of the entire book by historian Gloria Dabbay, “Davao City: Its History and Progress” and memorized the important parts. “I am fond of memorization,” he said. However, he did not look at preparing for the quiz as preparing for a competition. He looked at it as a journey back in time, imagining what it was like in the old days. And what he did not get from reading history books, he got from the stories told to him by his father, who personally experienced some of Davao’s recent history. 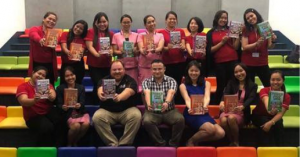 “Learning history can also be a bonding experience between the older and younger generations,” he shared. Young Davao historians have fun answering questions. Alut, who placed second, said that participating in the Davao Quiz inspired her as a future architect. “Reading about how Davao used to be a swamp and a forest and seeing it now with its massive infrastructure development made me realize how impressive the Davaoeños who built this city were through the years,” she exclaimed. What made a big impact on Albino, who won third place, was the “amazing resilience and strength” of Davaoeños throughout their colonial history. Councilor Pilar C. Braga chairs the Davao Historical Society that organizes the annual quiz event. These young history buffs have shown that the new generation of Davaoeños is not the self-centered and apathetic youth they are portrayed to be. They are interested in history and the lessons it teaches them about their place of birth and about themselves. 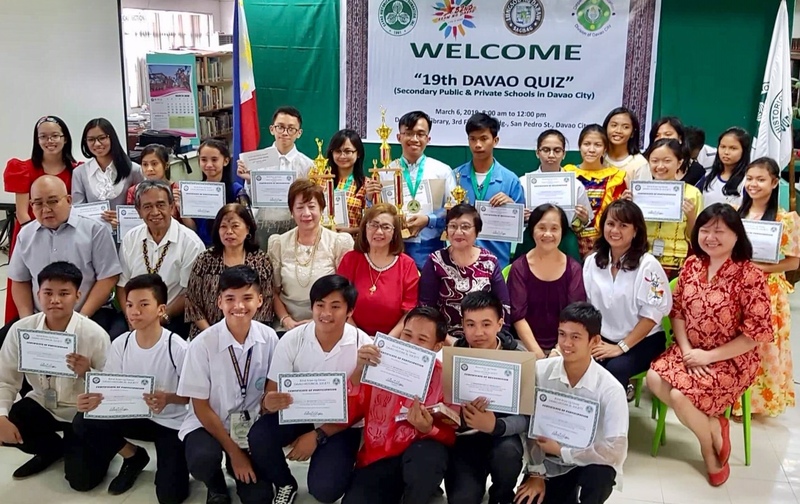 The high school students who participated in the Davao Quiz did not just know answers to history questions about their city. They also understood why it is important to know these things. 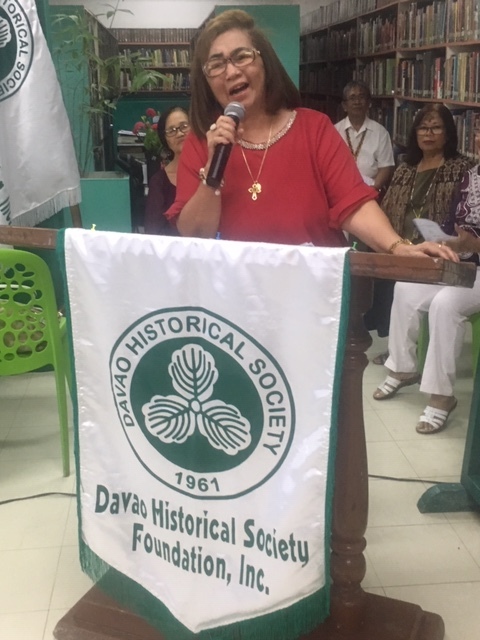 DHS President and Chair of the Davao City Council Committee on Education, Councilor Pilar C. Braga, emphasized the importance of history in educating our young people. “History helps us understand our identity as a people, our values and our character,” she stressed. 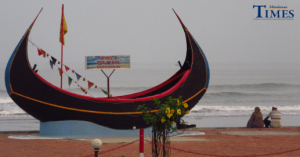 She believes that having an appreciation of history helps build good citizenship. Learning how Davaoeños came together as a community in the past shapes our identity and informs our role in making our city better today. JOHN PAUL Sapsal, the 19th Davao Quiz champion, is an 11th grader of Our Lady of Fatima Academy. That is why a major thrust of DHS this year is developing creative ways to make Davao history interesting for the new generation as well as engaging them in taking an active role in shaping history and instilling pride in themselves for being Davaoeños. “DHS is inviting and actively recruiting more young people to join us in this cause,” Braga added. Based on the success of the recent Davao Quiz, DHS has indeed proven that history is not just for old people. In fact, it is today’s young people who are creating history now.